Traditional building constructions take months and years. Pre-engineered buildings provide quick construction at a lower cost. Pre-engineered buildings also called as PEB, refers to a structure which is factory-built that are shipped to site and bolted together. PEB or structures are ideally suited for the manufacturing and warehouse segment. 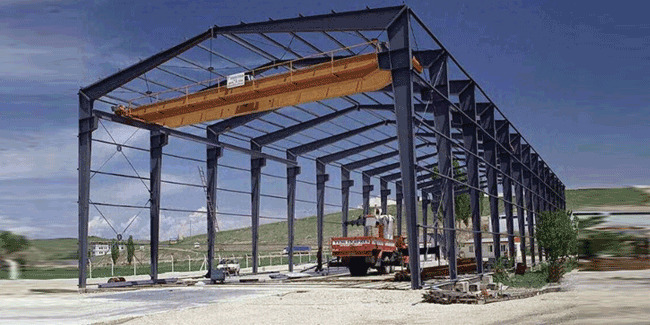 PEB companies are the ones who construct such pre-engineered steel structures. They are responsible for both designing and building structures within minimum time frame. Sandeep Sharma takes a look at the PEB segment. PEB structures are becoming the preferred way of construction in varied segments. The cost of the construction is low. They can be erected at a faster pace and at times can be dismantled and moved to another location. The foundations and floor slab are being constructed using traditional methods. The beams and columns comprising the structural system are being fabricated in the factory and then shipped to the site, lifted into place by cranes, and bolted together. Within few days, the structure is ready for commercial operations. PEB building system involves manufacturing of standardised components beforehand and assembling at the site based on the computerised design. Pre-engineered buildings are built with extreme precision and dimensional accuracy due to factory made components. This ensures maximum efficiency and proper utilization of space. Indoor tennis courts, Exhibition halls. Hospitals, Theaters, Auditoriums, Sports halls, Shopping center, Restaurant, Supermarkets,etc. The main advantage of Pre-engineered Building System vis-a-vis the Conventional construction technique lies in the saving of great amount of time, light weight building due to usage of high strength steel, computerized design leads to optimisation of resources and saves cost. Pre-engineered buildings offer numerous advantages mainly when the requirement is to construct low rise buildings. The PEB company involved is responsible for both the design and fabrication of the buildings. Use of steel as the main component in a PEB structure makes it insect and termite resistant thereby saving on the maintenance cost. Special coated steel is rust proof. PEB structures are quite durable and resistant to extreme weather conditions. 2/2018-19 | Tenders are invited for the construction of C.C. road & PEB Shed at Sardar Vallabhbhai Patel Cotton Subyard Hadadad of APMC-Botad. Supply and erection of prefabricated / pre-engineering toilet including civil, electrical, sanitary and waste management as per drawing in bid document. Pre-engineered structure of 0.6 mm Zero spangle skin, (250 MPa strength) made of 120 GSM, powder coated, cold rolled sheet for wall and roof sandwich panel. EPS filled sandwich panel thickness 40 mm and density 60 Kg per m3. Structure corner pillars made of 1.6 mm Zero spangle skin passed 120 GSM. Contacts: Executive Officer, Near Kachahari, Daltonganj, Jharkhand. Tenders are invited for supply of pre engineered building for 75MW SPV at GIPCL Charanka. Tenders are invited for design, fabrication, supply & installation of pre-engineered building (PEB) along with associated miscellaneous works for CISF Morcha at BARC. Tenders are invited for civil and pre engineered building works at Gumpro Drilling Fluid Pvt Ltd. Range Hills Road, Kirkee, Pune-411003, Maharashtra. Tenders are invited for design, engineering, preparation of drawing, supply, fabrication transportation, erection, documentation & handling over of pre-engineered building (PEB) warehouse (WH-2&WH-4) at KKNPP-3&4 site. Tenders are invited for construction of PEB in BDL. Kanchanbagh, Hyderabad. Contacts: Dy. GM (Corp Comm. ), Gachibowli, Hyderabad 500032, Telangana. The PEB structures are environment friendly as the main component used is steel. Steel is recyclable and can be used number of times. Once the PEB structures are close to its life cycle, it can be demolished in no time and the steel can be reused or recycled. Even during the construction phase, the wastages are to the minimum as components are manufactured with predefined specifications and measurements. Most of the pre-engineered buildings nowadays follow the green building features. The design incorporates green features which leads to saving energy and have minimum impact on the environment. Some of the green features include energy efficiency, made out of an environment friendly material and offers a healthy and conducive indoor living environment. In advanced countries, more than 70% of all single storey non-residential construction involve pre-engineered building systems. The PEB concept is well received in North America, Australia, U.K. and other European countries. The Pre-engineered Buildings industry in India has evolved over the years. The industry is fast adapting to the latest construction techniques and best practices. To improve the competitiveness and ensure high quality projects, the companies involved are adhering to building codes and rapidly becoming one stop solution to meet the client's construction requirement. The structures are built to provide stability and with high quality steel that is sustainable and environment friendly. The pre-engineered buildings market is driven by the increased demand for warehouses due to spurt in e-commerce activities. As per the industry sources, the Pre-Engineering Building market is likely to grow at around 11 per cent CAGR and estimated to reach US$ 3.56 bn by 2020. The focus of the government in boosting the agro processing activities has also lead to the increase in the need to build warehouses on a larger scale. India is becoming the fastest growing market in the PEB construction segment and holds immense growth potential for the players involved and huge benefits for the end user.